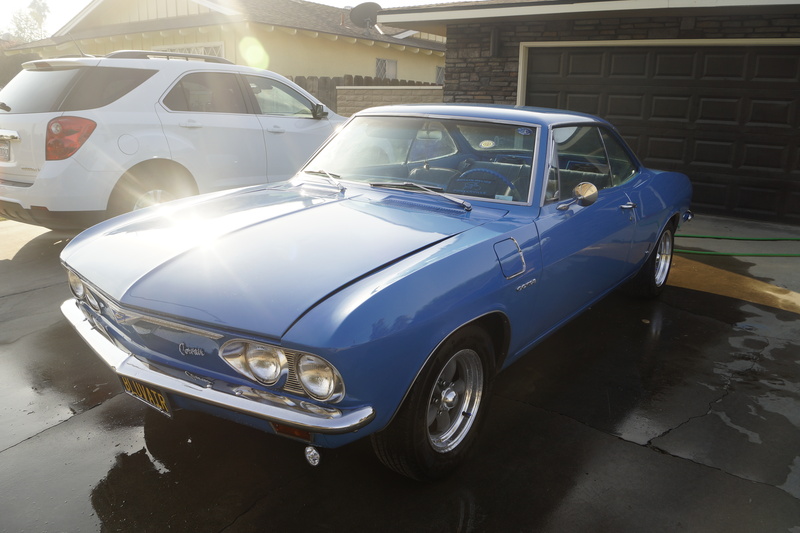 How can you tell if a Corvair has tinted glass? Are there markings on the windshield or is there something in the Vin number? For one the glass will not be clear it will have a green tint to it and in the corners it will say Soft Ray and the windshield if it is shaded will have a darker band across the top and could say tinted/shaded in the corner. If the car was originally equipped then in the Accy code it will be noted. You can look it up. Ok thank you. The car I’m looking at is in the shade so it’s hard to see the tint. Put a piece of white paper behind the glass. You'll see the faint green tint easily. Fisher body ID Plate has an E in the first position for "all tinted glass"
This is a 1965 Corsa Turbo Coupe built in Los Angeles and sold in the area when new. 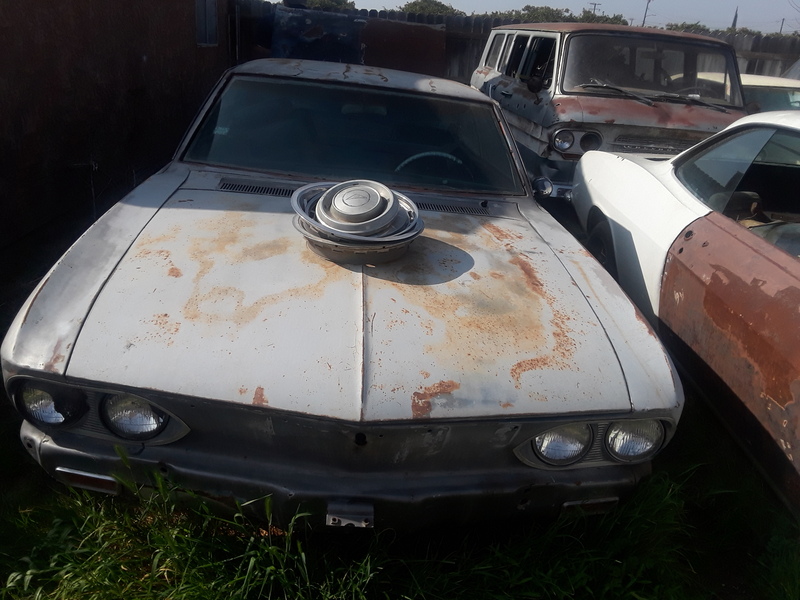 It's quite rare for most Corvairs. More common for ones sold originally in the southern states. Early cars 1960-1963 (or might have been 1964) used EZEYE for the tint logo, and after that GM switched to Soft Ray on the logo. It is a very convoluted story about EZEYE and Soft Ray, but all replacements for the Soft Ray that was installed at the factory if replaced afterwards, it was replaced with EZEYE. Both glass were manufactured by LOF (Libby Owens Ford). In short, the change was brought about as a trademark dispute between GM and LOF, as to who owned the EZEYE trademark. It was settled by Soft Ray being OEM, and EZEYE being the replacement logo. Some glass also says EZ EYE (I think). Late model factory glass has Soft Ray etched into it. Late model replacement glass has EZ EYE etched into it. Same glass, same factory manufacturing it, different Logo for different market. Edited 1 time(s). Last edit at 04/14/2019 08:15AM by junkman. My car body tag has the "E" indicator for all tinted glass, but it must have faded or the glass has been replaced or whatever because there doesn't seem to be any green tint. The windshield is separating around the outer edges of the glass (you can see it if you click on the photos in my signature and zoom in), so I am in the process of replacing it with an after-market windshield, and then I will have the rest of the windows professionally tinted in the modern style. Then my tag will be telling the truth again! Edited 2 time(s). Last edit at 04/14/2019 08:45AM by playerpage. > different Logo for different market. I made the comment of the Soft Ray etching as 99% of the Corvair people out there looking for tinted glass want to OEM "Soft Ray" glass. This holds especially true if they are building a concourse car. I have come across the EZ Eye glass and usually pass it over. Edited 1 time(s). Last edit at 04/15/2019 04:55AM by gnvair.